← FROM THE EDITOR … Natives! I love fly fishing. I love the way trout feel on a fly rod. I love casting and working the water with a fly rod. Sometimes, though, a fly rod isn’t the ideal piece of equipment for the situation. Sometimes a spinning rod is more effective for presentation. I’m no purist. When it comes to trout fishing, or any type of fishing for that matter, I take the opportunities that are given me and do my best, even if it means fishing a fly on a spinning rod. 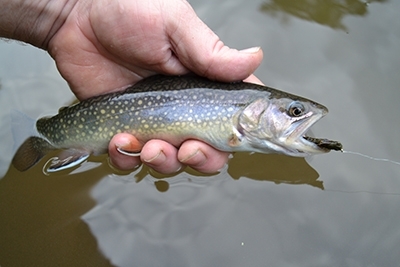 The week of April 20, 2015, the Pennsylvania Fish Commission was supposed to stock trout in three streams in Butler County – Little Connoquenessing Creek, Connoquenessing Creek, and Thorn Creek. My buddy Jim fishes Connoquenessing Creek, which runs right through the city of Butler, fairly often. When I talked to him on Friday of that week, he said he’d fished that morning and caught upwards of 30 trout. That’s a pretty good day no matter where or when you fish. We were supposed to fish together on a different stream the next morning, but when I found out the rest of the story, we quickly made plans to meet back at the Connoquenessing. Saturday morning started out slow. Jim and I each caught two or three in the first hour. Around 10 o’clock I started getting frustrated. I knew there were a ton of fish in that stretch, and I knew I should be catching a lot more than a few trout. I tried every bait in my arsenal – wax worms, meal worms, two different colors of salmon eggs, two different colors of Power Bait, and even a spinner – and nothing seemed to work any better. Jim caught a couple on Trout Magnets, including a hefty 21-inch rainbow. Still, it just seemed like we should be catching more fish. After all, there was a whole truckload of trout in that pool. Literally. A whole truckload! While the fish commission was stocking another part of the stream, the aerator system in the stocking truck began malfunctioning. The water in the holding tanks was getting depleted of oxygen and the warden was afraid they would lose all of the trout, so they diverted the truck to the nearest stocking point on the Connoquenessing. About 3,000 trout went into that one stocking point! Can you see why I was getting frustrated by only catching a couple fish in the first hour? On a typical day, three trout in the first hour would be pretty good. But when you know there are 3,000 fish in front of you, three trout in an hour doesn’t seem like many. And then I tied on an olive Woolly Bugger. Hello, Mr. Trout! I caught three fish on three casts – all big, chunky rainbows. I gave Woolly Buggers to a few people nearby and they started catching fish on every cast, too. Pretty soon we were all slamming trout. I’m not sure exactly how many we caught, but for the next three hours we caught one after another. When we first got to the stream that morning, only a handful of fishermen were there. By noon, each side of the stream was elbow to elbow for about two hundred yards. Word about the stocking had spread. The mysterious part of the whole thing is that nobody was really catching many. One here and there, but that’s about it. The best I could figure was that the cold water made the fish sluggish. The trout just weren’t hungry. However, any time you find a group of fish, you can take advantage of their competitive nature and make them strike on impulse instead of hunger. That’s why the Woolly Bugger was so effective. I fished it on my spinning rod and drifted it through the current the same as I would bait. When it got to the part of the pool where I thought the fish would be stacked up, I gave it a couple quick twitches. The trout reacted to the movement and grabbed the fly on impulse. I love banner days. They don’t happen that often, but when they do, they leave a lasting impression. That day on Connoquenessing Creek was a memorable one indeed. Sometimes you have to keep an open mind on a trout stream, even if it means fishing a fly on a spinning rod. That day wasn’t the first or last time I’ve resorted to using flies on my spinning rod. I’ve also found spinning rods work much better when fishing small streams, especially ones that are crowded with brush. The shorter length of an ultra-light spinning rod makes navigation and casting streamers and nymphs in those situations much easier.